Dana Murray, who recently was named the CGA’s Women’s Volunteer of the Year for 2018, was asked what appeals to her about the volunteer work she does in golf. The answer she gave would no doubt apply to many of the volunteers who selflessly give of their time to make golf events, programs and tournaments the successes that they are. Murray came to golf relatively late in life, but took up the game wholeheartedly at age 45. But that was in the midst of her professional career — she spent 27 years as an Arapahoe County judicial officer, mostly as a County Court Judge — so it was after retiring in 2016 that she went into golf-related volunteer work with a passion. Murray became an on-course rules official for the CWGA and for the LPGA Amateur Golf Association, formerly known as the Executive Women’s Golf Association. Now, in fact, Murray serves on the national tournament committee for the latter organization. Rules officiating led to Murray being invited to join the board of directors for the CWGA in 2017. The CWGA and the CGA integrated on Jan. 1, 2018, and Murray became part of the CGA board. And, as of this year, she’s part of the CGA’s Executive Committee, along with the Nominating Committee. “One of the main bloodlines for the CGA is the volunteers. Whether they are course rating, rules officiating, helping with programs or serving on our board, we wouldn’t be able to do all that we do without them. 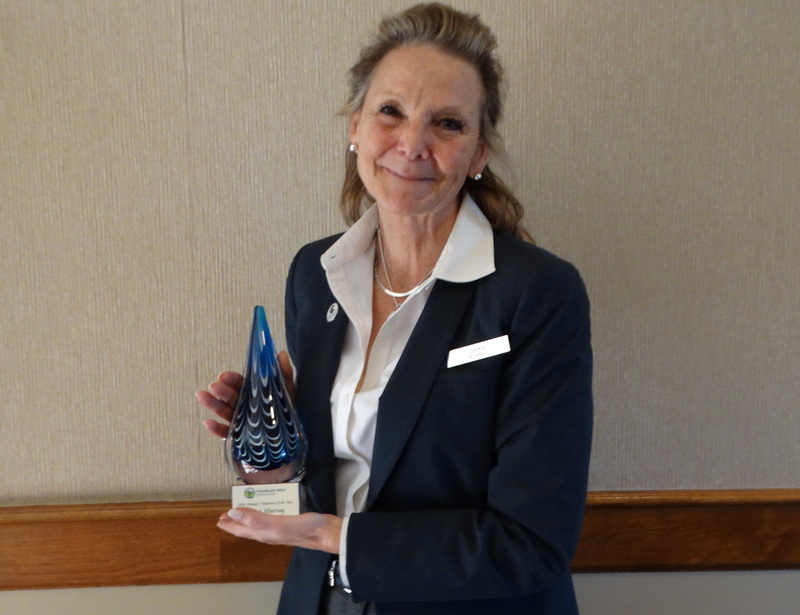 “This year our Volunteer of the Year went above and beyond the call of duty. Dana Murray first joined the CWGA board of directors in 2017. When the two boards for CGA and CWGA came together, Dana volunteered to be on the CGA Governance Committee and was soon charged with updating the bylaws to reflect the integration of the two associations. As background, Dana is a lawyer and former judge. Like past CGA Jim Topliff on-course rules official award winner Tom Kennedy, Murray used her background as a judge to make a seamless transition to becoming a rules official. Dana Murray at last year’s U.S. Senior Open at The Broadmoor. But it was Murray’s volunteer work at last summer’s U.S. Senior Open at The Broadmoor in Colorado Springs that might have made an equally large impression. As co-captain of the CGA volunteer team there, Murray was one of the people responsible for organizing and overseeing the CGA volunteers who were based on the par-5 ninth hole at the East Course, which happens to be one of the farthest points on the golf course from the golf shop and the hotel. “This is going to sound like complaining, but it’s actually in great praise for all of those other volunteers,” she said. “We were on No. 9, the farthest (hole) away from everything and it was so hot and there was no shuttle for the volunteers, so everybody had to hoof it all the way up there and we were really shorthanded so I couldn’t very well give them lunch breaks and even if I did it would have to be like 2 1/2 hours because they had to walk all the way down to headquarters. 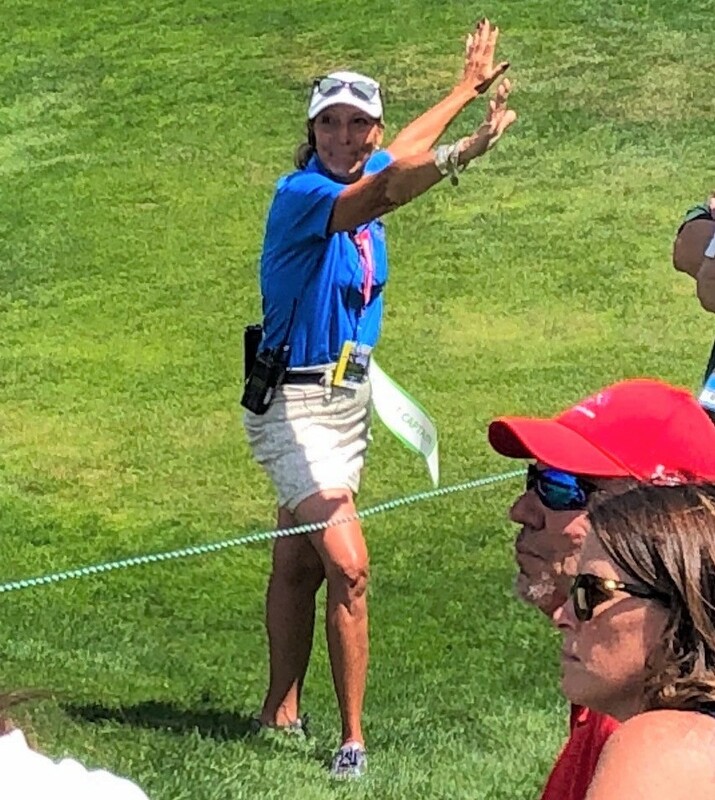 As for her duties as a rules official, she plans on working five or six CGA women’s tournaments this year, in addition to three or four with the LPGA Amateur Golf Association. With the modernization of the Rules of Golf that took effect on Jan. 1, it’s been a demanding time for rules official to get up to speed on the changes. But, though Murray likens learning the Rules of Golf to “drinking out of a fire hose”, she said the process has been a good thing for her. “I came to golf very late. I’m not one of those girls who played in college or high school or anything like that,” she said. “But because I am a rules person, I always made it a point to know the rules. Becoming a rules official, you start peeling the onion layers and you learn them better. Being a rules official has deepened my understanding of the rules and given me even a greater appreciation for all that’s our game. Murray works mainly the CGA women’s championships in which the majority of competitors are 20-plus handicappers, a category in which Murray herself falls, as a 27. Murray takes pride in being a dedicated golf volunteer, and for her family’s longstanding Colorado roots. A graduate of Manual High School, Colorado College, and the University of Denver law school, she’s a third-generation Coloradan.